From snow showers to spring flowers, we've got the charmer for you! Bearfootin' is a private, forested, two-story, stone's throw from the water, first-tier lakefront log home with 7-person Catalina Spa housed in open-air mahogany gazebo, offering spectacular lake and mountain views and all the comforts of home! Set atop a hill amidst giant granite boulders and mature pines, Bearfootin' is high above the hustle-and-bustle of daily life. This Boulder Bay getaway is undeniably 'cute and cozy' yet elegantly sophisticated. This log home is endowed with floor-to-ceiling knotty pine throughout, having an open-trellis cathedral ceiling. Its charm is only enhanced by its custom mountain decor. Take some time out to cuddle up next to Bearfootin's massive, native-rock, woodburning fireplace... always a heart warmer! For your apres-ski pleasure or any time, Bearfootin's seven-person Catalina Spa is the perfect aperitif to any day on the mountain or the lake! The spa is housed in a darling mahogany 'doll-house' style gazebo, providing guests with an added element of comfort and privacy. Looking out over the lake and surrounding mountains, it truly embraces all that nature has bestowed on this land! Bearfootin' is located just a short walk around the corner to scenic Boulder Bay Park (walkout fishing pier, beach area, launch/rent kayaks, anchor boat, walking path, picnic tables, covered pavilion, public facilities), a 1-minute drive to Pleasure Point Marina (boat rentals of all sorts, fishing gear), 2 minutes to the Performing Arts Center, 4 to 5 minutes to the festive Bavarian-style Village of Big Bear (restaurants, pubs, coffee houses, bakery, shops & boutiques, galleries, 2 movie theaters), Alpine Slide (snow tubing~water slide in summer), horseback riding, mountain biking, zip line, swim beach (lifeguarded) and much more. Only 4.5 - 4.7 miles (Google Maps) to the slopes for our skiers and boarders! Gas heat provided for your comfort. Always a heart warmer! Bearfootin's floor-to-ceiling native stone-of-the-mountain wood burning fireplace is always inviting on a cold winter's night(or morning!)! Gather round...hot chocolate,anyone?! Good news! Off-street parking is provided. The paved driveway will accommodate a maximum of 3 cars. It runs alongside the cabin for ease of access to entry. Stay connected during your stay at Bearfootin' with wireless internet service. Login and email friends and family, telling them how much fun you are having in Big Bear! Bath towels, hand towels and washcloths will be provisioned for your stay. We suggest bringing beach towels, or the like, for spa use. Take in spectacular panoramic lake & mountain views from the living room!You'll enjoy comfortable seating on full size sofa, love seat,2 fireside recliners & fireside pub table & stools in window. Toaster oven provided for baking, broiling and toasting. Full compliments of dishware, serverware, glassware, silverware, cookware, bakeware, knive set, eating and cooking utensils provided for your use. Enjoy Bearfootin's fully appointed kitchen for your home-cooked meals and convivial conversation. Propane and charcoal BBQs are provided for your outdoor grilling pleasure! The dining area is located in the kitchen,a bistro table/stools located in living area,fireside.For outdoor dining, an 8-person picnic table is provided as well as a bar & stools at gazebo~lake views! Mega-programming available with satellite TV. A 48" smart TV provided in the living room and a 40" smart TV in upstairs bedroom. Enjoy complimentary Netflix in both settings! Vacation? Time for fun & games! A full selection of board games and card games, to include an old-fashioned checker board, are provided for your pleasure! Bearfootin' provides a bluetooth speaker that allows you to enjoy your iTunes, or the like. You may also enjoy a broad selection of music via Sirius Radio and a variety of cd selections thru the TV. For your Apres ski pleasure or a day on the lake,relax in Bearfootin's 7-person Catalina Spa,housed in an open-air gazebo providing privacy & protection from the elements,bar & stools.Lake/mtn views! 2 Private Bedrooms, Linens & Towels Provided, Spectacular Lake & Mountain Views(offered from interior of cabin as well as surrounding property-over 1 acre of terrain-great sledding!Equipment provided), Large 7-Person Spa(*SEE PHOTO-lake & mountain views), Doll-House Style Gazebo(w/bar & stools houses spa for privacy & protection), Large Private Front Deck (*SEE PHOTO - lake & mountain views), Large Private Property (lake & mountain views), Custom Mountain Decor, Massive Woodburning Native-Rock Fireplace (*SEE PHOTO), Fully-Equipped Kitchen (includes all major appliances, small electrics, utensils, dish/glassware, cookware, etc, ),Wireless Internet, Satellite TV (upstairs & downstairs), CD/Ipod Adaptable/AM-FM Stereo, Clock/Radio/Alarm (both bedrooms), Charcoal BBQ Grill (utensils provided), Large Picnic Table (*SEE PHOTO - lake & mountain views), Folding Chairs & Loungers, Paved Driveway, No Pets/No Smoking. 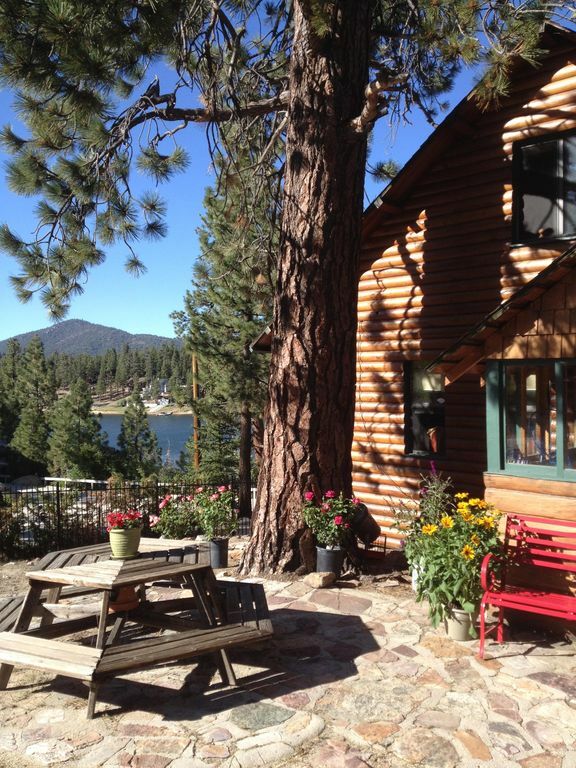 Bearfootin' is located in a convenient locale to all points of interest and activities throughout the four season's Big Bear Lake Mountain Resort. Boulder Bay Park: The cabin is just a short walk around the corner to scenic Boulder Bay Park, renowned as one of Big Bear's most-beautiful waterfront sites (great photo-op!)! It offers a walkout FISHING pier, always hungry duckies, beach area, picnic tables, covered pavilion, walking path, rent/launch kayaks, paddle board, anchor boat, public facilities . . . walk to Blanca & Pierre's Restaurant (see menu online) and Boulder Bay Market (convenience items, firewood, fishing license) on the east side of the park. Pleasure Point Marina: The marina is a one-minute drive from the cabin, offering boat rentals of all types, as well as fishing gear. The Village of Big Bear: Just a 4 to 5-minute drive from the cabin, the festive, Bavarian-style Village is beautifully landscaped to include fire rings to warm by during the frostier times of year! You'll enjoy coffee houses, restaurants, pubs, galleries, boutiques, fudge factory, beef jerky, ice cream, old-fashioned candy, strolling, people watching, window shopping, Christmas corner (during the holiday season) and much more! Hiking: One of the best trails in all of Big Bear is located within walking distance from the cabin, toward the dam, just off the blvd. You'll want to be sure to checkout "Castlerock" ~ spectacular photo-op at the top, taking in all the elements of the Big Bear Lake landscape! Alpine Slide at Magic Mountain: Enjoy snow tubing by winter and a water slide during summer. Fun for the whole family! Located approximately 3-minutes from the cabin. Horseback Riding: There are stables located at Magic Mountain for your riding pleasure, 3 to 4-minutes from the cabin. Mountain Biking: There are many locations throughout Big Bear for scenic, challenging riding, or a leisurely cruising (bike rentals available). If the latter, you'll enjoy the Peddle Path that is a 4-mile ride around Big Bear Lake. If your up for the adventure, take the Sky Lift up Snow Summit (summer months) and bike down . . . you may need a BBQ fix mid-mountain! See trail maps or contact the Visitor's Center for more information. Super Market: The Vons and Stater Brothers markets (as well as Blockbuster, CVS, Walgreen's, Radio Shack...) are both 5 minutes door-to-door, directly off Big Bear Blvd, traveling east from the cabin.